Recently in the Gulf of Mexico, we deployed three of the or pipelines for spill event markers. Indeed this method of glider systems into a loop current eddy to prove that the ve- observation has already been used by government researchers hicles were capable of simultaneously navigating and collect- during the Deepwater Horizon / Macondo oil spill incident. ing useful data in challenging environmental conditions. The Overall, gliders are another good example of how autono- vehicles experienced surface currents in excess of 3.5 knots mous technology can provide enormous commercial, opera- but were able to effectively navigate once below the effect of tional, and environmental bene? ts to an industry which has the eddy. Every 4 hours the vehicles would call back to the extremely high safety requirements and shrinking budgets. Houston-based ? ight control center. The gliders provided data Gliders can not only collect environmental data, but can pro- about the eddy water mass and, more importantly to the op- vide the operational support that surface vessels provide now, eration, actionable information about the speed and direction all at a fraction of the cost. of the current. In the past vessels have been used to monitor Market forces and technological advancements are converg- the current in challenging areas. 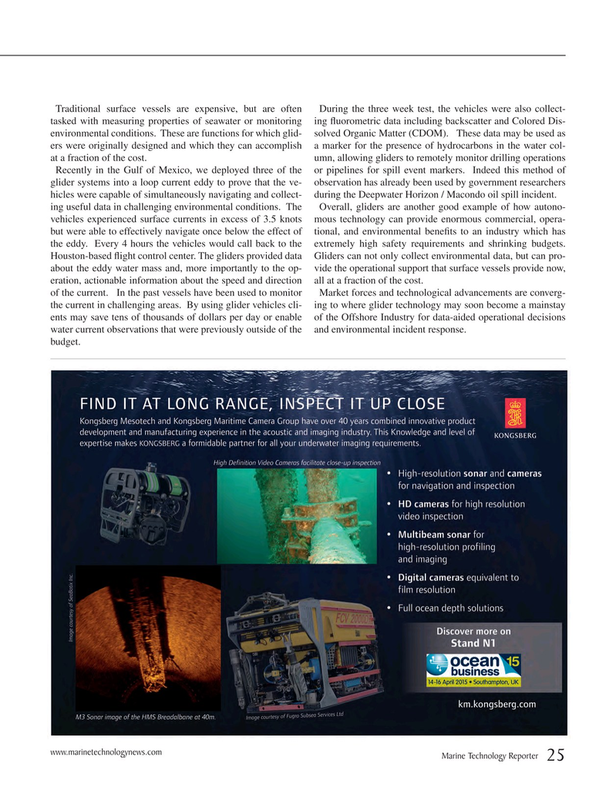 By using glider vehicles cli- ing to where glider technology may soon become a mainstay ents may save tens of thousands of dollars per day or enable of the Offshore Industry for data-aided operational decisions water current observations that were previously outside of the and environmental incident response.